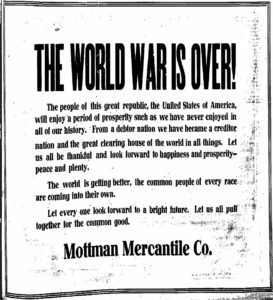 In early November 1918, people knew the war that had torn Europe and much of the world apart was almost over. On November 7 at Compiègne, Supreme Allied Commander Ferdinand Foch ordered the guns in his sector to stop so German envoys could cross the line to negotiate an armistice. Somehow, a United Press correspondent mistook this pause in firing to mean that fighting had officially ended and cabled his office in New York City. The story quickly spread and celebrations erupted all over the United States. News that the war was over first reached Olympia, still in the midst of the 1918 flu pandemic, in the morning, but did not become widely known until the early afternoon when special bulletins of Tacoma papers started to circulate. Local newspapers quickly issued their own headlines. 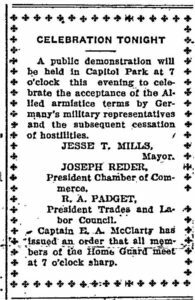 “Germany Defeated!” the Olympia Daily Recorder announced, telling people to come to an official demonstration at Capitol (Sylvester) Park that evening. 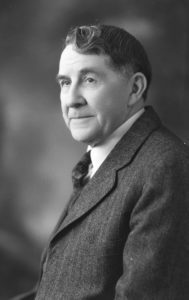 Washington State Public Lands Commissioner Clark V. Savidge, pictured here around 1929, spoke to crowds at Capitol (Sylvester) Park on November 7, 1918. Many discarded their gauze flu masks to celebrate and stores and businesses closed. People put up flags and patriotic decorations while others carried small flags. Around 7:00 p.m., a parade wound its way to Capitol (Sylvester) Park, led by the Home Guard and Sloan Shipyard’s band along with anyone who could drum on everything from empty milk and gasoline cans to dishpans. Clark Savidge, State Commissioner of Public Lands, concluded the parade with a speech highlighting the duty of the American people to care for wounded soldiers and disabled veterans. Widows and orphans of soldiers who perished in the conflict also needed assistance. After Savidge’s speech, victory parties continued until midnight. Other Thurston County communities held their own celebrations. When the war actually ended on November 11, crowds gathered to celebrate as they had before but Olympia had no formal events. Governor Ernest Lister declared it a state holiday and many businesses closed. Lister gave a speech on the Capitol steps early in the morning, drawing a large crowd. 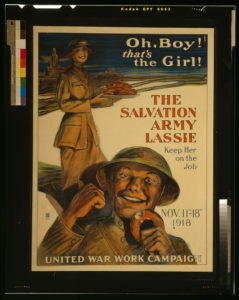 The war was over, but it would be some time before American soldiers would return home. The flu epidemic was still in full swing. This year marks the 100th anniversary of the conflict, an event in world history that still casts a large shadow.